The Spa Frog is a floating water purifier specifically engineered for the warm temperatures of spa and hot tub water. It features a mineral cartridge and a bromine cartridge that are designed to dissolve slowly to deliver continuous, low levels minerals and bromine to spa water. The bromine dispenser allows for the adjustment of bromine levels to suit your particular spa. Spa minerals and bromine supplement your sanitizing system, reducing the need for additional bromine and chlorine by up to 50%. 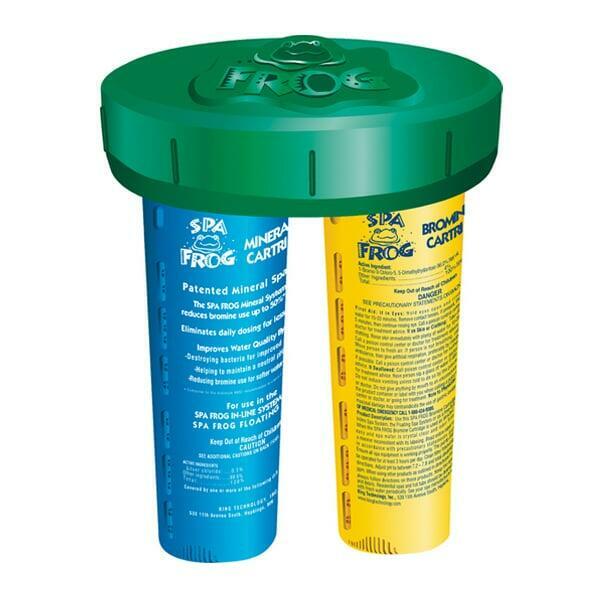 The Spa Frog system destroys bacteria naturally and improves overall water purity. It employs the same process that nature uses to purify streams and creeks. Fewer chemicals in your spa water means softer, silkier water that is less irritating to skin, eyes, and sense of smell.